We had been in Christchurch for a couple of days and had already exhausted our guidebooks’ restaurant recommendations one way or another. (Some we ate at, some were too pricy, some WAY too quiet for dining with a baby…). It was our last night there and we were wandering around, hoping to find some inspiration for a place to eat close to our hotel in Cathedral Square. At that point we were tired out from a great day of sightseeing, our daughter had passed out in the stroller, and we would probably have settled for Subway if one had presented itself. Luckily, instead we noticed a small sign, right around the corner from the Starbucks in Cathedral Square, that said “Vegetarian Cafe”. 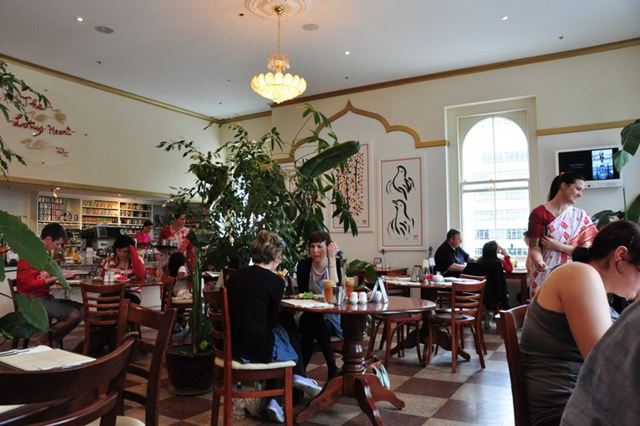 “Cafe” sounded reasonably priced and not overly fancy, Wendy’s vegetarian, so that seemed promising and we were right in Cathedral Square – about a 2 minute walk to our hotel. Sold! We carefully walked up the long flight of stairs with our stroller carried between the two of us. There is no elevator and we sure didn’t want to wake a sleeping baby! We entered the restaurant (which also houses a gift shop and has a take away/take out in bio-degradable containers – with a charge for each container) and were treated to a great surprise! Approximately a million years ago (ok, actually, it was in 2000/2001) we lived in France. We spent lots of weekends in Paris (thank you now-defunct Air Liberte and your insane couples’ discount!) and ate at this awesome vegetarian restaurant there all the time. It was run by devotees of Sri Chinmoy – an Indian guru, and the walls of the restaurant were covered with his paintings. Well, we couldn’t have been more pleasantly surprised than to walk into The Lotus Heart and see…the same paintings! Well, at least, the same style. Sure enough, The Lotus Heart is run by devotees of the same Sri Chinmoy! Now, the only question was, how would the food compare to our favorite restaurant in Paris? We were quickly seated by the hostess, who, like the waitresses was dressed in a sari. Our table had a great view out over Cathedral Square and we were offered the use of a highchair (unfortunately, it was the only thing in the restaurant that wasn’t sparklingly clean). The restaurant is filled with lots of plants and there are fresh flowers on the tables. The menu ranges from “burgers” and pizzas to Indian favorites, with mains in the $20-$25NZD range. There is no alcohol served, but we accompanied dinner with a lovely bottle of sparkling grape juice. 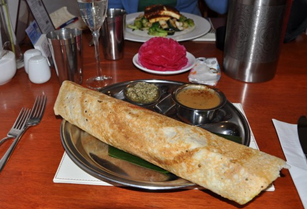 Ian ordered the Masala Dosa, $20NZD. It was FABULOUS! The potato filling was very flavorful, yet still mild (and not just by his standards!). It was also HUGE! The dosa itself was slightly chewy and somehow managed not to be greasy. It was served on a banana leaf lined Indian metal plate. 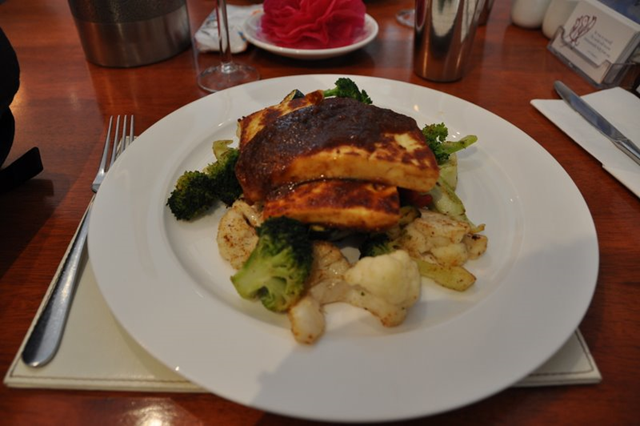 Wendy had the Paneer Steaks, $25NZD. Cooked in maple syrup (!) and served with paprika roasted vegetables it was an awesome twist on an Indian favorite. Extremely flavorful and fabulously delicious! Dinner was so awesome that we decided to order dessert, too! Ian accompanied his with a cappuccino. It came hot (as it should) and with a nice foam. The Chocolate Velvet Cake we ordered lived up to its name! It was FABULOUS (and Wendy does not say that lightly or without thorough “research” into chocolate cakes all over the world). Served with toasted almond ice cream, the cake was intensely chocolaty and very smooth. Well worth the fairly steep $11.60NZD! (It’s also available in a vegan version and the one we ordered was gluten-free!) The ice cream wasn’t creamy enough for our taste, but it did have lots of almonds and paired well with the chocolate cake. Overall, we had a wonderful dinner at The Lotus Heart. Even for a confirmed non-vegetarian like Ian, there was plenty of choice and the food was filling and delicious. Vegetarians and vegans will especially delight in the wide array of choice. The friendly, prompt service, fabulous location and great views are just the icing on a great cake. We only wish The Lotus Heart was located a bit closer to us, so we could go back!